This picture shows the Bulliver Bridge as it is in 2012. Bulliver Bridge is part of the footpath that brings you up to the Totnes Riverside (Littlehempston) Station platform. Since this picture was taken, the phone box has been placed to the left of the path. There are no current plans to put a public phone into the box. 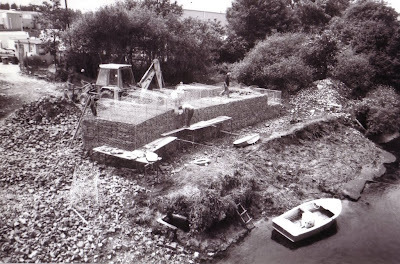 At the time that the erection of the building was complete, there was no access to the town of Totnes, as the station is on the opposite side of the River Dart from the town. However, the South Devon Railway Trust with financial help from British Rail Community Unit, Devon County Council, Rural Development Commission, South Hams District Council, Countryside Commission and Dartmoor National Park and other benevolent sources, built a footbridge over the river which today connects to the town and the mainline station. The bridge was named 'BULLIVER'; a name which locals had long ago used when GWR operated the line, calling the locomotive 'Bulliver' and the name has now passed to the bridge. .The picture above shows the Bulliver Bridge during construction. Opening of the Footbridge to the Station . The Bridge linking the town of Totnes by footpath to Totnes Riverside (Littlehempston) Station was completed in May 1993. It was duly opened by Iain Sproat M.P. Under Secretary of State at the Department of National Heritage. 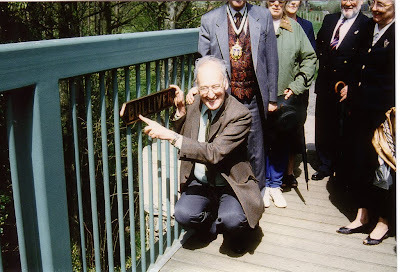 The picture above shows the Patron of the South Devon Railway Association, David St. John Thomas admiring the Bulliver nameplate affixed to the bridge in May 1993. Arriving at Totnes by car, we suggest you park in main line station car-park and following the signs, make your way along the path which leads to the bridge. A further short and picturesque walk brings you to the station. It is approximately 465 yards from the Main Line Car Park to the Totnes Riverside (Littlehempston) platform. The cost of car parking in the Totnes Railway Main Line Station Car Park is currently £5.80 for 24 hours, Monday to Friday, and £3.50 for 24 hours on Saturdays and Sundays.